Story of a Smile: A BIG, long weekend! Phew! I am tired! 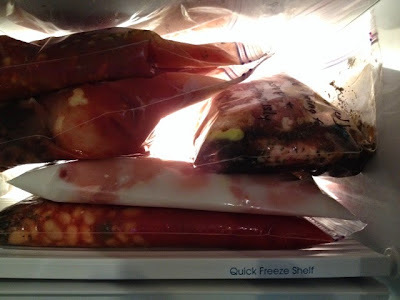 I spend this last weekend having a mass cooking spree and end up preparing 16 future meals that are now safely frozen until their future use. :) We now have crockpot meals and casseroles, healthy foods and some comfort foods, and ALL sorts of types of food - mexican, thai, italian, etc. Some are new recipes and other are new "experiences". I am pretty excited to try the new ones & I am sure that I will be documenting the good ones right here! Check out one of the shelves in our freezer!